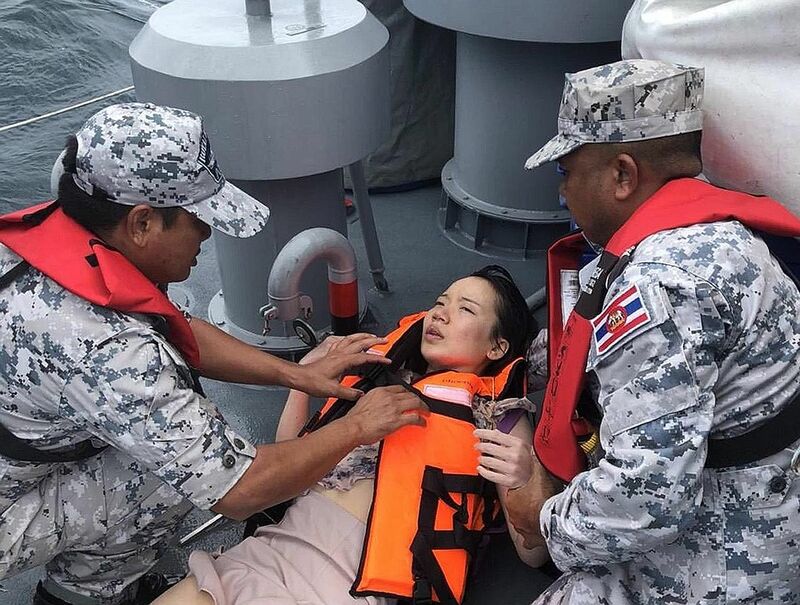 BANGKOK • Thailand's navy pulled 33 bodies from waters off the coast of the holiday island of Phuket yesterday after a tourist boat went down with dozens of Chinese passengers on board. The double-decker cruise ship Phoenix PC Diving had capsized in rough seas on Thursday with 105 people on board, 93 of them Chinese tourists, along with 12 Thai crew and tour guides. Mr Somjing Boontham, who said he was the captain of the Phoenix, said he had urged passengers to put on life jackets while crew members frantically lowered lifeboats as huge waves slammed and tilted the boat. Pictures from the scene showed lifeboats carrying up to 20 people, some of them children. Forty-nine people were rescued, but 23 were still missing. Rear Admiral Charoenphon Khumrasee, deputy commander for the Thai navy in the southern region, said navy divers, frogmen and marine police divers, as well as helicopters, had been sent to the scene. "We will conduct air searches and send divers to check inside the sunken Phoenix boat," Phuket Governor Noraphat Plothong said yesterday morning. "Police investigators said most of the tourists were wearing life jackets. I assume they are trapped inside the boat," he said, adding that he hoped some had survived. However, one official said he feared there was "no chance" of any more survivors, which would mean a death toll of nearly 60. "A day and a night has passed," said the Marine Department's deputy director-general Kritpetch Chaichuay, referring to the chances of more survivors being found inside the boat. The navy said divers had spotted "quite a few bodies" in the sunken vessel. Ambulances were waiting to receive further bodies at Chalong Pier on Phuket Island yesterday. "Right now, officials from the marine police and navy are helping to dive at the spot where the boat sank," the Marine Police said in a statement. "They are diving to a depth of about 40m." Thailand is in the middle of its rainy season, which usually runs from May to October, and often generates high winds and flash storms in coastal areas, especially on its west coast on the Indian Ocean, where Phuket is located. Police are investigating the incident. The boat, which went down about 7km from shore, was properly registered and had not been overloaded, police said. Tourist Police Bureau deputy chief Surachate Hakparn said in a post on Facebook that tour operators had been warned about the severe weather. "Be careful… nature is not a joke," Major General Surachate wrote. "The Tourist Police warned businesses in Phuket already to not take boats out from shore, but they violated this order by taking foreign tourists out," he said. Deputy Prime Minister Prawit Wongsuwan ordered a probe into why "the boat went to sea" despite a weather warning of strong wind. A representative of the operator of the boat, TC Blue Dream, declined comment when contacted. The Phoenix was among several boats that appeared to have ignored a severe weather warning in place since Wednesday to take tourists on day-trips to the islands that dot the seas off Phuket. Several other vessels hit trouble late on Thursday. Initial reports from officials said all of the passengers on those boats were rescued. The Chinese Embassy in Bangkok said it had asked the Thai government to make all-out rescue efforts, and had sent a team to Phuket to help. Chinese consulate staff in southern Thailand were on the scene helping its citizens, it said. In Beijing, a Foreign Ministry spokesman said China's top leaders, including President Xi Jinping, were paying close attention to the incident.